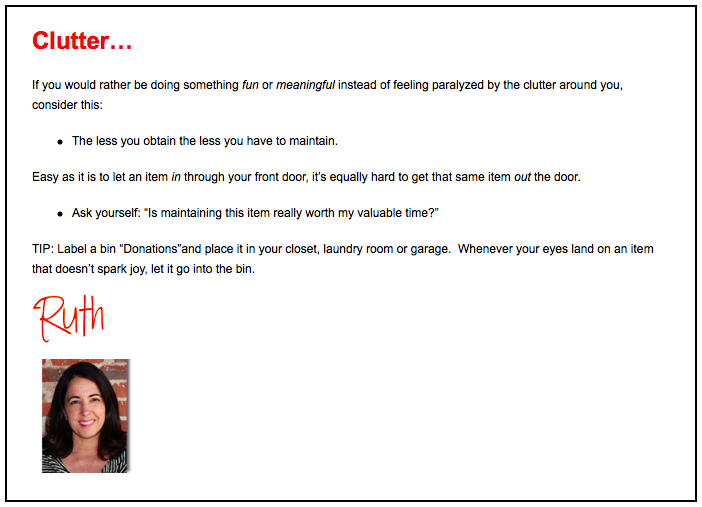 Are you feeling paralyzed by clutter? Check out this simple, yet profound Streamlined Solution by Ruth Hadlock of Streamlined Space. What is your ‘big yes’? And what are you going to say “No” too? Today’s society is so “go, go, go” “do, do, do” and “spend, spend, spend” that every day we have numerous invitations to say yes. Within all of this craziness, most of us are moving through this life like zombies; constantly maxed out just from the overwhelm of all that stands before us. We are simply just saying yes to too many things. The brilliant Stephen Covey said, “You have to decide what your highest priorities are and have the courage – pleasantly, smilingly, unapologetically – to say ‘no’ to other things. And the way to do that is by having a bigger ‘yes’ burning inside.” Yes, yes, yes! Today, I invite you to schedule some time for yourself to reflect on what the “bigger yes” is stirring deep down in your soul. Once you have an idea of what that is, breathe deeply and feel into what allowing that into your reality would be like. Then think about what it would be like to say no (“pleasantly, smilingly, unapologetically”) to everything else. You REALLY do get to decide what you engage with. It may take some time to get clear about what you really do want and then more time to transition into a new way of living, being and interacting with the world, but it IS possible. Here’s to consciously choosing our realities! Marla on TV showcasing cool containers! We have put a lot of thought into helping you this year with the chronic clutter areas! Our tip here is to choose a cool and practical container for the incoming information and paper. If you have piles of paper and written notes covering your kitchen counter or desktop, check out the two containers below. We hope you will love them and use them as much as we do. Cool Tool – Make it Pretty, Practical & Portable! To transform your paper piles check out The Acrylic Desktop File from the Container Store. Earlier this month, Marla was invited to Good Things Utah to share all about it, plus some other great paper containers we love! Click on the picture below to watch it. The Pretty, Practical & Portable Paper Container! Do you have piles of paper on your kitchen counter? You’ve got to check out this cool container! Have you noticed just how much we LOVE containers?! Don’t let our enthusiasm make you think you we like all of them equally though. We are a bit particular, as they’ve got to be beautiful, functional and fit our personalities. When it comes to our desktop action system, we have found a new one that we are just thrilled to share with you. How come we love it so much? If you feel the same way we do and just have one for yourself, you can Shop The Container Store Here. We’d also love to hear about your favorite desktop file containers. Or if you have questions, please ask in the comment section below.